I read this article and found it very interesting, thought it might be something for you. The article is called FCI: Understanding A Behemoth and is located at https://archive.indiaspend.com/sectors/the-food-corporation-of-india-understanding-a-behemoth. India’s rotting foodgrain story is not new and is often narrated in the context of the fact that some 228 million Indians are undernourished. Most of the blame for rotting foodgrain and the mismanagement of its distribution is laid at the doorstep of the state-owned Food Corporation of India (FCI). IndiaSpend’s Sourjya Bhowmick does a snapshot study of the FCI, the body responsible for procuring, storing & distributing foodgrains through the Public Distribution System (PDS) in general as well as into various schemes like the ambitious Mid Day Meal scheme. So where does the FCI come from? Set up in 1964, the FCI procures foodgrain from farmers throuh commisson agents, sometimes directly while in a few cases the State Governments also buy on behalf of the FCI. The foodgrain is stored in various warehouses throughout the country and then distributed to the State Governments. It is the State Government’s job to send the foodgrain to the Fair Price Shops (FPS) or ration shops, found in many communities across India. FCI’s primary role is thus restricted to procurement, storage & delivery to State Governments. Incidentally, the private markets for foodgrain (where many of us shop at) operate through scores of intermediaries between the farmer and end-consumer. The mandis buy foodgrain from the farmer (at low prices); it then goes through several intermediaries even as prices rise at every stage. 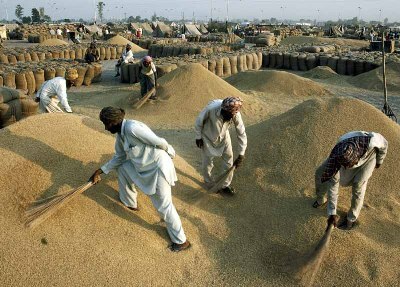 FCI also supplies foodgrain to private markets through its Open Market Sale Scheme. This is mostly an ad hoc arrangement. FCI, under instructions from the Government also periodically sells foodgrain (wheat and rice) at pre determined prices in the open market. The idea being to ensure foodgrain supply during poor seasons, to moderate the influence on open market prices, to sell off excess stock, to reduce transportation cost of foodgrain, to free storage space for the next season and to save foodgrain from deterioration in quality. Stock which still remains could be exported. Another important FCI function is ensuring price. The Government fixes the Minimum Support Price (MSP), at which foodgrain is to be purchased so that farmers get remunerative prices. The quantity to be distributed under PDS and for other welfare programmes is also decided by the Government. Naturally, there is a difference between the actual cost (MSP + procurement + distribution) and the issue price is the operational loss reimbursed by the Food Subsidy. FCI does not make profits and runs entirely as a loss making entity. The loss is borne by the taxpayer through the Food Subsidy. This should give you an idea: The economic cost of rice and wheat in 2010-2011 was Rs 1,981 per quintal and Rs 1,513 per quintal respectively. In the Budgeted Expenditure of 2011-2012, the same is Rs 2,069 per quintal of rice and Rs 1,581 per quintal of wheat. The total sales of FCI were Rs 25,567 crore for 2010-2011 as against Rs 23,320 crore in 2009-2010. The purchase made by FCI was Rs 73,325 crore in 2010-2011 as against Rs 62,731 crore in 2009-2010. The carrying cost of buffer foodgrain was Rs 6,337 crore. FCI’s 2011-12 Annual Report is still not out so the financial data is old. FCI does not make any profits, but only operational losses which are reimbursed by the Government. Apart from losses due to holding the minimum support price (MSP) for farmers, there are other losses too. FCI also receives a major chunk of its funds from the Food Subsidy allocation (apart from the reimbursement of operational loss mentioned above) that is budgeted every year by the Department of Food and Public Distribution, under the Ministry of Consumer Affairs, Food and Public Distribution. The Food Subsidy budget of 2012-2013 is Rs 75,000 crore. A scan of the table above shows you the rising subsidy. The total subsidy bill as well as the subsidy of the FCI oversteps the assumptions made in the budget. Now, let’s look at procurement, storage and public distribution functions of the FCI in some detail. FCI procures foodgrain in order to ensure that farmers get a minimum support price or MSP and that foodgrain are made available to the weaker sections. Around 14,000 procurement centres were operated during 2009-2010. FCI procures independently as well as from State Government agencies. FCI documents say that as of May 2012, total rice procurement stood at 32.4 million tonnes, 2 million tonnes less than what it was in 2010-2011. However, the decrease in FCI’s procurement is nothing new. The year 2009-2010 and 2006-2007 had seen decreases of 21% and 25% respectively. The shortfall is mainly in the states of Andhra Pradesh, Punjab and Orissa. Incidentally, Orissa and Andhra Pradesh were severely affected by droughts. This is the total allocation and offtake of rice, for the year 2011-12, upto February 2012 for all states under TPDS. Here are current figures released by the Government on May 28, 2012. The data is updated till March 2012. Total allotment of rice during March 2012, under TPDS; which includes BPL, APL and Antodaya Anna Yojana (AAY) was 2.2 million tonnes, against which the offtake was 2 million tonnes, which is 93.4% of the total allotment. Total rice offtake (which is the quantity lifted) during March 2012 in all schemes was 2.6 million tonnes. Of these, 2 million tonnes went into the Targeted Public Distribution System (TPDS) and 0.57 million tonnes for other programmes. The BPL allotment was 0.97 million tonnes, off take was 0.94 million tonnes, which is about 96.9% of the total allotment. The allotment of AAY (Antodaya Anna Yojana) was 0.57 million tonnes, off take was 0.55 million tonnes, which is 96.7%. When all foodgrain is not lifted, this ultimately leads to open sale by the FCI. This is the total allocation and offtake of wheat, for the year 2011-12, upto February 2012 for all states under TPDS. These are the latest figures for wheat which the Government released on May 28, 2012. These figures have also been updated till March 2012. The total off take of Wheat has been 2.2 million tonnes, 1.6 million tonnes under TPDS and 0.58 million tonnes for others schemes. The total allotment of Wheat, under TDPS and other programmes was 1.9 million tonnes, against which off take was 1.6 million tonnes, which is 82.9% of the total allotment. Interestingly, the allotment of wheat for BPL was 0.48 million tonne and the off take was 0.50 million tonnes, representing an off take of about 104%. The allotment of AAY was 0.27 million tonnes, of which 0.25 million tonnes was lifted, which is an off take of about 92.5%. FCI also supplies foodgrain to programmes like the Mid Day Meal Scheme, Wheat Based Nutrition Programme and Annapurna Scheme, among others. FCI’s job of storing foodgrain also attracts the most criticism. Allegations of foodgrain rotting in godowns are legion. Of the total of over 33 million tonnes, 15.64 million tonnes is owned while 17.96 million tonne is hired. Let’s do a status check as things stand right now. Total stock of foodgrains with Government procurement agencies as on 1st March, 2012 was 54.4 million tonnes. As we mentioned earlier, FCI’s capacity is 33 million tonnes. An FCI document also says that utilization of effective storage capacity currently stands at 85%. Reports also suggest that there are numerous warehouses lying unused, almost 1 % of the total usage capacity. While the FCI is a loss making bodyits sales and purchases have been increasing. But there are other losses too, in storage and transit operations. From 2008 to 2011 the total loss due to these two factors has been Rs 1,311 crore and losses are increasing over the years. The FCI undoubtedly plays an important role in the India’s foodgrain supply chain. It’s also clear that over the years, its ability to expand its role and yet fulfil the basic role of food security has been somewhat wanting. And yet, as we have seen, foodgrain production continues to rise in India. Managing surpluses can be as if not more challenging than managing scarcities.